Arab grocers in massive food stamp fraud. « Psychology and White Ethnocentrism. 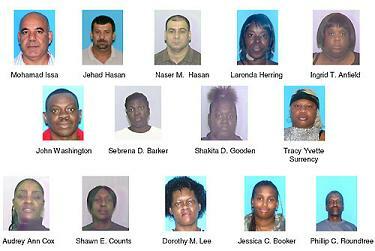 Three Arab grocers arrested along with 11 food stamp recipients in massive food stamp fraud. More arrests could follow. A Hollywood woman is among 14 people charged in a food stamp fraud investigation in South Florida, the Florida Department of Law Enforcement said Tuesday. All 14 are charged with defrauding the state out of more than $4 million through electronic food stamp benefits cards, authorities said. Hollywood police assisted in the investigation. Shawn Elizabeth Counts, 44,of Hollywood, was charged with three counts of public assistance fraud, according to FDLE. Eleven of those charged are from Miami-Dade County, while one man is from Kissimmee and another person is already a prisoner. Investigators say the owners of a Miami supermarket charged the state twice the amount the food stamp recipients received in their fraudulent transactions. This entry was posted on Tuesday, July 31st, 2007 at 1:43 pm and is filed under Uncategorized. You can follow any responses to this entry through the RSS 2.0 feed. Responses are currently closed, but you can trackback from your own site.